Oleander, Nerium oleander, is a poisonous shrub. It is commonly used in gardens because of its pink colored flowers. Nerium oleander is native to northern Africa, the eastern Mediterranean basin and southeast Asia. 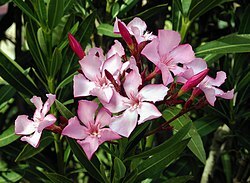 Oleander prefers dry, warm climates and may naturalize in such areas. Recently, scientific studies on cardenolide oleandrin show that it may be used to prevent mutagenesis. ↑ Osterloh J, Herold S, Pond S. Oleander interference in the digoxin radioimmunoassay in a fatal ingestion. JAMA 1982; 247: 1596-7. This page was last changed on 25 September 2014, at 13:41.